If you have a small or large group you may wish to organise a custom or group booking. Generally we take people in multiples of 12 but can organise something for 8 people should you require it. We have enough boats to have up to 46 people on the water at the same time and more if required. A group booking can just be one of our normal wildlife or day trips or a customised trip to suit you and your group. It could be a transfer to/from Millport, Brodick on the Isle of Arran or any of the small ports on the Clyde. 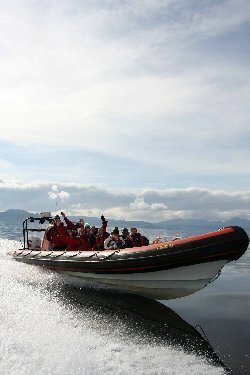 A group booking can leave from Largs Yacht Haven (Marina), Largs Promenade, Glasgow or many other locations. Just let us know with your requirements. The speed and manoeuvrability of our boats allow us to take you to areas seldom visited, providing you with close encounters of the Island’s wildlife safely and enjoyably. Although we are based on the West Coast of Scotland we are fully mobile and can bring the boats to your location. Please just get in touch with us with an enquiry. Each trip is unique and varies according to the season. There are daily sightings of Seals, Oyster Catchers, Gannets, Cormorants and occasional sightings of Porpoise, Dolphins and Whales. Each of our drivers will give you a different slant onto their own insights and knowledge of the area here on the Lower Firth of Clyde, but all follow a common theme of being informative, interesting & fun. Each boat trip is tailored and driven to suit the type of group that is on board whether it be a family groups with small children, a bunch of mates or some real wildlfe enthusiasts. 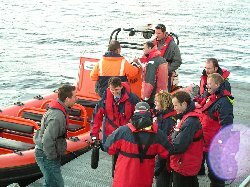 All our boats are compliant with the stringent standards set out by the Marine & Coastguard Agency (MCA) requirements and are fully insured. All safety equipment you may require is provided. Our trips are guided & skippered by experienced qualified professionals. Cumbrae Voyages is owned and Operated by Total Yachting Ltd.